We are pleased to inform you that Hidden Gem stock of May'14 - Rane Brake Lining Ltd (BSE Code: 532987, NSE Code: RBL) has given absolute returns of 532% and is a 6-Bagger stock for our Hidden Gems members in period of 2 years and 5 months. Our team suggested Buy on Rane Brake Lining Ltd at price of Rs. 200 on 31st May 2014 with a target price of Rs. 410. Stock achieved its target price and we informed our members to continue to hold it for long term. Stock price of Rane Brake Lining has made its all time high of Rs. 1399 recently on NSE and closed at Rs. 1264.20 today giving as on date returns of 532% in period of 2 years and 5 months. Rane Brake Lining (RBL) declared strong set of numbers in June quarter and also paid off long term borrowings. The company registered sales & operating income of Rs. 121.46 crores (up by 17% YoY) for June quarter, as against Rs, 103.62 crores for the corresponding quarter in the previous year, net profit of the company is at Rs. 10.49 crores, up by 117% YoY. The company’s overall India OEM sales and Aftermarket sales registered a healthy growth of 16% and 29% respectively during the quarter. RBL enjoyed good growth in the OE segment on the back of mass supplies to successful models in passenger car and utility vehicle segments. The robust growth in the Aftermarket segment is attributed to increase sales of Asbestos-free linings and favourable pull in northern and southern region. As informed by the management, the company undertook various cost reduction initiatives resulting in favourable material cost and reduced operational cost. The company’s better cash generation and internal accruals helped to repay long term loans and significantly reduce finance costs during the quarter. The Rane group was established in 1929, comprising of seven companies with twenty five plants dedicated to automobile component manufacturing. It symbolizes the successful integration of global quality with indigenous expertise. It employs over 5200 highly trained personnel. Headquartered in Chennai, the company has pan-India presence with 25 manufacturing facilities across states including Pantnagar (Uttrakhand). Rane group manufactures a comprehensive range of automobile components like hydraulic power steering systems, manual steering & suspension systems, valve train components, friction material products, steering columns & electric power steering, seat belt systems and die casting products. It is the leading OE supplier of various auto components. The group exports to 31 countries around the world. Rane Brake Lining Ltd (RBL) was established in 1964 and has achieved the distinction of being domestic leader among friction material manufacturers. RBL manufactures friction material products like brake linings, disc pads, clutch facings, clutch buttons for automotive applications and composite brake blocks for Railways. It supplies friction products for all surface transport applications from motorcycles to trains. RBL had an annual sales turnover of INR 38355 Million in 2013 - 2014. RBL has four plants located in the major Indian cities of Chennai, Hyderabad, Puducherry and Trichy. These were established in 1964, 1991, 1997 and 2008 respectively. RBL is equipped with state-of-the-art facilities. During the year 2008-09, the company completed the expansion project in Trichy in the state of Tamilnadu with the active participation and technical inputs from the company's collaborator, Nisshinbo Brake Inc, of Japan. The state of the art plant commenced commercial production during the year. They increased the production capacity of Asbestos by 4,645 MT to 18,892 MT. During the year 2009-10, the company further increased the production capacity of Asbestos by 96 MT to 18,988 MT. RBL is having collaboration with Nisshinbo Industries Inc., Japan and this helps RBL in bringing out truly world-class products for our customers. R&D is given high priority and it is equipped with latest testing facilities. R&D centre is approved by Department of Science & Technology, Government of India. All four plants are equipped with production facilities to manufacture different types of products. 9 depots are situated across the country with concentration on south, north and west in India to cater to aftermarket requirements. RBL manufactures Brake Linings, Disc Pads, Clutch Facings, Composite Brake Blocks and Clutch Buttons. RBL products are used in brake system between wheel and brake shoe to decelerate & stop the vehicle and in clutch system between flywheel and clutch plate to transmit rotary motion. The products are supplied in Asbestos (A) and Asbestos Free (AF) grades to OEMs through brake assembly manufacturers (Tier-1), aftermarkets and export markets. RBL supplies friction material to all leading OEMs in India through brake / clutch assembly manufacturers, aftermarket, export market for Heavy Commercial Vehicle (HCV), Light Commercial Vehicle (LCV), Utility Vehicle (UV), Passenger Car (PC), Two Wheelers (2W), Tractor segments and Indian Railways. ii) Aftermarket segment: There are more than 10,000 dealers serviced by 7 Whole Sale Distributors (WSD) across the country. RBL has 9 depots spread across the country with location choice specific to business density for servicing the market requirements. iii) Export segment: RBL exports to Australia, Sri Lanka, Bangladesh, United Kingdom and Middle East countries for independent aftermarket products. BS OHSAS 18001:2007 - Occupational Health & Safety Management System. Rane Brake Lining Ltd has informed BSE that the Board of Directors of the Company at its meeting held on May 21, 2014, inter alia, has recommended to the shareholders a dividend of Rs. 7.50/- per equity share on the paid up equity capital of Rs. 7,91,49,800 comprising of 79,14,980 equity shares of Rs. 10/- each fully paid up. The Register of Members & Share Transfer Books of the Company will remain closed from July 12, 2014 to July 22, 2014 (both days inclusive) for the purpose of Payment of Dividend & Annual General Meeting (AGM) of the Company to be held on July 22, 2014. The dividend will be paid to the eligible shareholders on July 28, 2014. Rane Brake Lining Ltd. (RBL) was awarded the prestigious Deming Grand Prize 2013 at a special ceremony held in Tokyo on 14th Nov’13. Mr. P.S. Rao, RBL President, received the DGP Award from Mr. Masahiko Sakane, Vice-Chairman, Deming Prize Committee, on behalf of Mr. L. Ganesh, Chairman, Rane Group. The DGP win marked a glorious new chapter in RBL’s Excellence Journey towards achieving its vision of being the global supplier of choice in friction material. RBL now joins the elite group of 26 other companies the world over and seven other firms from India which have previously won this prestigious Award in Total Quality Management (TQM). It also gets the distinction of being the first friction material company in the world to have won the Award. With this prize, RBL becomes the third company from the Rane Group to have won DGP, making it the first group in the world to have three DGP Awards consecutively outside Japan and also the distinction of being the second group in the world to have won more than two DGP Awards. RBL has been actively engaging in developing new friction materials to meet emerging OEM customer requirements on Quality, NVH (Noise, Vibration and Harshness) and also ensuring cost effectiveness. Significant progress has been made by the company towards improving the available range of applications in quick time to market by enhancing “Formulation Library” and using it effectively. Development of new grades pro-actively for un-served segments as a new approach has been taken. Focus areas are development of cost effective Asbestos free grades for Brake Linings and Disc Pads for PC, UV, HCV and LCV markets for improving market share in both OE and Aftermarket. Joint development with Nisshinbo, Japan is an important initiative for serving OEMs and also ensuring maximum localisation of raw materials. RBL’s own efforts for development of low cost formulations is also continuing at a fast pace. In order to combat stiff competition including overseas players, the Company is also focusing on development of alternate and green materials for performance and cost factors in collaboration with global suppliers. Specific R&D efforts to meet field performance requirements in passenger cars and utility vehicle segment helped the Company to add new product platforms of the customers and offer competitive technical alternatives to our competitor products including imports. The Company could gain new business based on competitive performance proposals from major OEMs. RBL has developed new asbestos-free friction materials for domestic commercial vehicle and global OEM customers with high-life liners for stringent city bus applications as well as for global OEMs in India to whom full LCV / M&HCV range of products were offered. Despite sluggish automobile market conditions, Rane Group has chalked out an expansion strategy with a budget of Rs 558 crore for the next three years as the Chennai-based leading auto component house expects the market to improve from the second half of the fiscal and report strong growth in the following two years. The group’s capex has also been necessitated as part of its strategy to maintain leadership in its business segments and achieve sales turnover of Rs 4,300 crore by 2015-16. The investments will be made across seven entities, including three listed companies, of the group. “The capex of Rs 558 crore is for the total group during the next three years ending 2016. It will be funded through internal generations and debt,” said L Ganesh, chairman, Rane group. Most of the capex is intended towards expansion of capacity of steering gear, EPS (electric power steering), friction materials, including brake linings and disc pads, while part of it is towards productivity improvement and research and development. In an attempt to be technologically self-sufficient, the group has been steadily boosting R&D investments — from 0.5 per cent of sales in the past to 1.5 per cent going forward. Of the seven companies, Rane Madras and Rane NSK Steering Systems will spend Rs 160 crore and Rs 150 crore, respectively, on expansion of capacity in various areas on the back of new customers. Rane Brake Linings will spend about Rs 110 crore over the next three years on R&D as also to improve export business. Rane Engine, Rane TRW Steering Systems, Rane Diecast and Kar Mobiles will account for the rest of the spend. “Our capex plan is based on the assumption that markets will start improving towards the end of this year (although current signs are not encouraging) and the next two years will be seeing healthy growth. Besides the domestic market, we are also focusing on increasing exports, which is expected to be 15 per cent of sales by 2015-16,” Ganesh said. Despite a slowdown in the auto sector, the group managed to post a decent growth in FY13, with total revenues of Rs 2,923 crore ($538 million) against Rs 2,650 crore ($520 million) in FY12. Net profit of Rane Brake Lining rose 141.62% to Rs 95.2 million in the quarter ended March 2014 as against Rs 39.4 million during the previous quarter ended March 2013. Sales rose 7.74% to Rs 1085.9 million in the quarter ended March 2014 as against Rs 1007.9 million during the previous quarter ended March 2013. For the full year, net profit rose 89.12% to Rs 172.1 million in the year ended March 2014 as against Rs 91.0 million during the previous year ended March 2013. Sales rose 2.03% to Rs 3835.1 million in the year ended March 2014 as against Rs 3758.8 million during the previous year ended March 2013.
i) India is becoming a preferred destination for many global automobile manufacturers to set up their manufacturing facilities. RBL is facing stiff competition in OEM business from both local players and global competitors. Entry of global auto majors is likely to encourage entry of new global competitors for RBL. In aftermarket, which is highly fragmented, RBL faces stiff competition from large number of organized and un-organized players. ii) In terms of exports, foreign exchange fluctuations can adversely impact the operating margins and thereby affect the overall profitability of the company. Despite sluggish automobile market conditions, Rane Group has chalked out an expansion strategy with a budget of Rs 558 crore in 2013 for the next three years as the Chennai-based leading auto component house expects the market to improve from and report strong growth in the following two years. Rane Brake Linings will spend about Rs 110 crore over the next two years on R&D as also to improve export business. Most of the capex is intended towards expansion of capacity of brake linings and disc pads, while part of it is towards productivity improvement and research and development. In an attempt to be technologically self-sufficient, the company has been steadily boosting R&D investments — from 0.5 per cent of sales in the past to 1.5 per cent going forward. The Company remains cautiously optimistic about the growth of the automotive industry. With easing of inflation rates and hopes of interest rate cuts, the economic growth is likely to build gradual momentum. The newer vehicle models introduced in the market are likely to spur the growth. With profitable growth continuing to remain the focus area, the Company plans to expand its horizons by adding new territories and new customers. Promoters have increased their stake in the company through continuous open market purchases. Share holdings of promoters in the company by end of Mar’14 quarter is 65.60%, increased by 2.65% during one year. In Mar’13, the same was 62.95%. RBL is paying regular dividend to the shareholders since past many years. Recently, company has declared dividend of Rs. 7.50 which will be paid on 28th July’14. With Rs. 7.50 dividend payout, dividend yield at CMP of Rs. 200 is 3.75%. The Company would continue to take rigorous efforts to retain the market leadership by developing customized products for the customers. The Company in collaboration with the Nisshinbo Brakes Inc., Japan provides the state of- the-art technologies for applications in new generation vehicles. Moreover, RBL holds the distinction of being the first friction material company in the world to have won the most prestigious Deming Grand Prize 2013. This catapults RBL to a new league altogether and marks another step in its journey towards Excellence. i) Nisshinbo Brake Inc (NISB) who has been the technology partners of the company since 1996 have their shareholding of 20%. This will help the company in further advancement of research and development to meet the new technology requirements of the future. 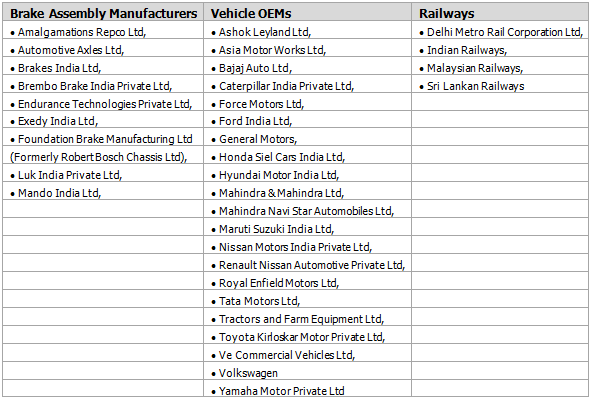 Indian automotive industry is dominated by Japanese and Korean auto manufacturers. The increased co-operation with Nisshinbo Group will not only serve the Japanese and Korean manufacturers but also other European and domestic car companies in India. The technical inputs and greater co-operation from Nisshinbo Group would thus be beneficial to the Company in terms of business potential and customer relationship. ii) The continuance of global majors in USA and Europe showing keen interest in sourcing auto components from India based on cost and quality, presents an opportunity for the company to grow its exports market further. The company believes to ride on the recovery in the domestic market while consolidating its operations. It has already taken a couple of initiatives to sharpen its cost competitiveness. The company hopes to do better in the following quarters due to expected less volatility in the commodity prices. iii) As per our estimates, Rane Brake Lining Ltd can deliver bottom line of 242 million for full financial year 2014 – 15, annualized EPS of Rs. 30.6 with forward P/E ratio of 6.5 X for FY 2014-15, which makes stock an attractive bet at CMP. iv) Management has rewarded shareholders by paying consistent dividends year after year. RBL has distributed 35% of its net profits in form of dividends. Dividend yield at current market price is 3.75, which offer good upside potential with limited downside risk. v) On equity of Rs. 79.2 million, the estimated annualized EPS for FY 14-15 works out to Rs. 30.6 and the Book Value per share is Rs. 141.8. At current market price of Rs. 200, stock price to book value is 1.41.
vi) Considering attractive valuations, and growth opportunities in domestic automobile industry, we find RBL a good investment opportunity. Saral Gyan Team recommends “BUY” on Rane Brake Lining Ltd. for a target of Rs. 410 over a period of 12-24 months. An opportunity missed an opportunity lost. If you have patience and want to add extra power in your portfolio, start investing some portion of your savings in fundamentally strong small and mid cap companies - Hidden Gems & Value Picks.